Music was different in the 1980s. When reminiscing on the rock bands that spent the decade dominating the music scene – Kiss, Mötley Crüe, The Clash, Whitesnake – these were the types of musicians that genuinely brought a party to every live show. For Colten Bell, that was the type of rock and roll that really stuck with him. He formed Testarossa with two other musicians, Jordan West and Buddy Radford, who he had played with in other bands that had recently broken up. After meeting Blake Webb through mutual friends, everything went up from there. While they have a serious 80s vibe, they are far from an 80s nostalgia or cover band. They are more interested in bringing rock and roll music back to a time where it was straightforward. No filler songs, no need to skip to the next track. Think more singalong choruses and less computerized instrumentals. Their first single, “Mother Lover”, couldn’t have been a more perfect introduction to Testarossa. The track was originally written in Bell’s and West’s previous band, the line “I won't tell your husband so don't tell my mom” coming to Bell one night while they were jamming and turning it into a revamped version late last year. It was one of three songs that they originally recorded before taking a shot in the dark and asking Asking Alexandria frontman Danny Worsnop to contribute some guest vocals to “Mother Lover”. Not only did he end up being featured on the track, but made a guest appearance in the music video. It all seemed like a weird fever dream for the band. Despite initially recording three songs for an EP, they were having too much fun to stop. By the time they were done having fun, an entire full-length record was finished. Late for the Party is due for a summer release. 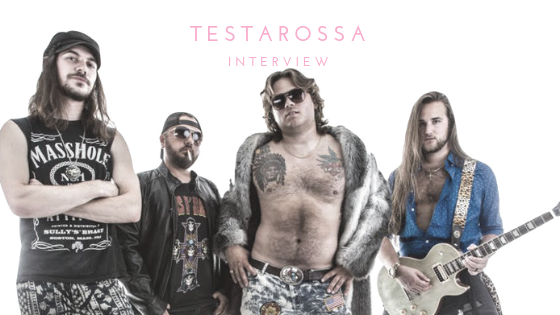 Testarossa may be late to the concepts of 80s hair metal and carrying around boom boxes, but that doesn’t mean that their influences growing up shouldn’t represent who they are today. As they gear up for their first full-length release, expect nothing short of a good time.